Thermal oxidation is a means often used to control emissions of Volatile Organic Compounds (VOCs) from process industries. Oxidation of the VOCs occurs when sufficiently high temperature (1,400° F.), adequate residence time, and turbulence are present to break the molecular bonds of any hydrocarbon to ultimately convert the hydrocarbon to carbon dioxide and water. With rare exception, thermal oxidation produces no harmful byproducts nor is there any hazardous waste to treat or dispose of. 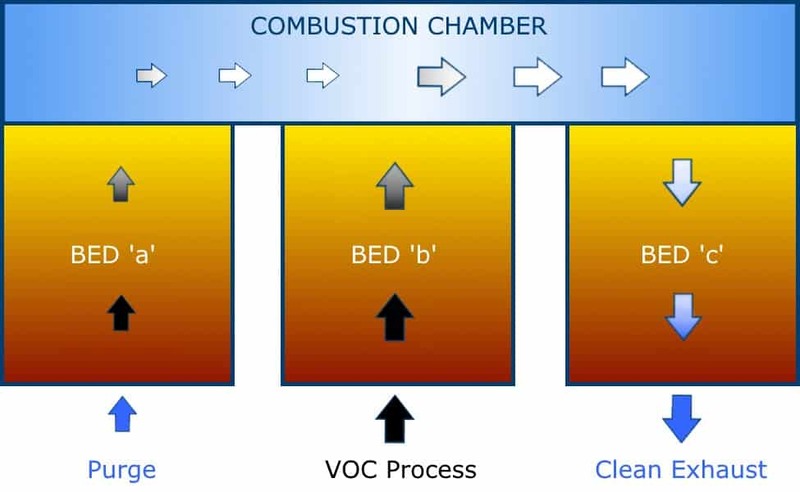 Though thermal oxidation is a simple process capable of very high VOC destruction efficiency, the fuel consumption and cost to heat the VOC laden process can be severe. A Regenerative Thermal Oxidizer, or RTO, builds on the thermal oxidation operating principles, but at greatly enhanced fuel efficiency. An RTO consists of two or more heat exchangers connected by a common combustion chamber or zone. The heat exchangers consist of beds filled with media which will allow air to pass while serving as a mass to store heat. The media material selection, size, and shape can vary greatly and substantially impact the design and utility efficiency of the RTO. Alliance Corporation manufactures Regenerative Thermal Oxidizers (RTOs) that use either a 2–bed or 3-bed mode of operation. We will look at the basics for each type below. For offline viewing, see the 'How Alliance Regenerative Thermal Oxidizers Work' (a PDF presentation). Our experienced engineers can help you to determine which Regenerative Thermal Oxidizer (RTO) type will be best suited to handle your facility's Volatile Organic Compounds (VOCs). You can contact us directly or complete our detailed online quote request form. 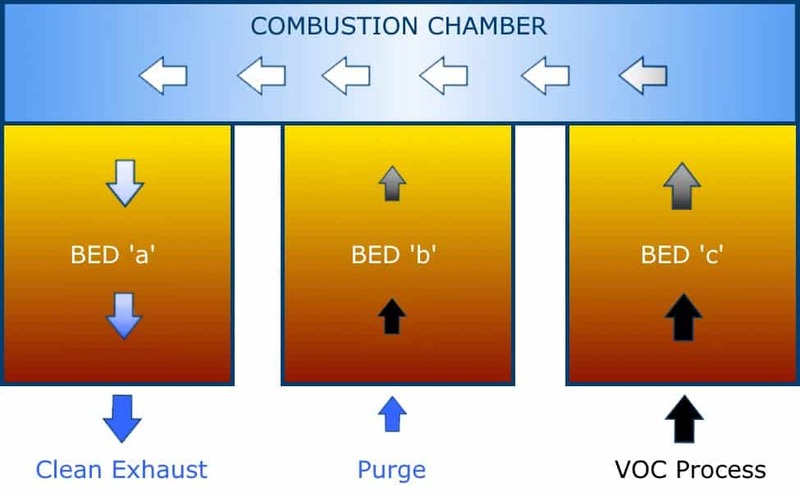 The flow through the heat exchange beds is reversed at regular intervals to conserve the heat of combustion within the RTO. 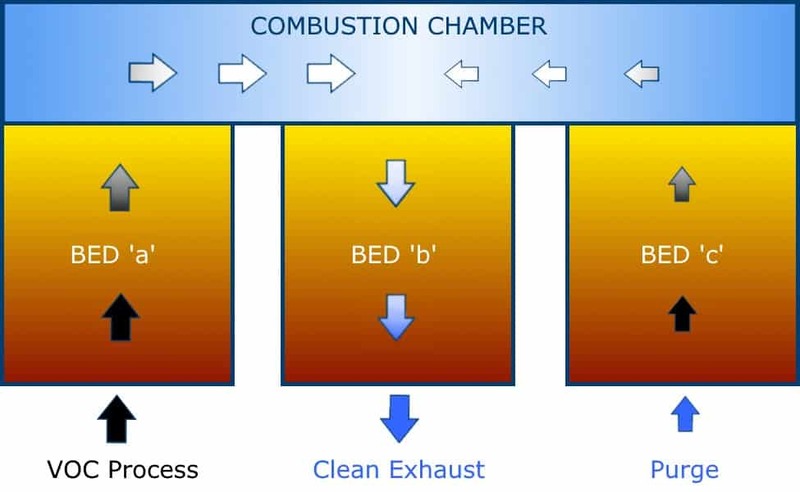 Depending on the application, up to 95% of the heat combustion can be recovered and recycled representing a huge fuel savings advantage relative to conventional thermal oxidization. In comparison to both thermal and catalytic oxidation, RTOs have the advantage of the VOC application flexibility and destruction capability of a thermal oxidizer with better fuel efficiency than a catalytic oxidizer, without the risk of poisoning or fouling expensive catalyst. 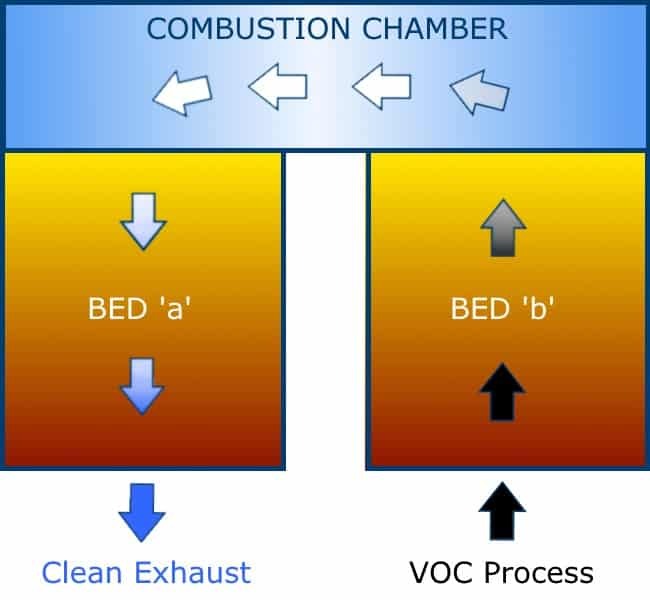 The VOC laden air stream enters the first heat exchange bed where the stream passes directly through the media where it is preheated in route to the combustion chamber where a burner adds any heat necessary to reach optimum combustion temperature to complete the oxidization process. Final Stage Before Being Exhausted to Atmosphere in Regenerative Thermal Oxidizers The now clean air stream next enters a second heat exchange bed where the clean stream passes directly through the media where the stream is cooled while simultaneously heating the media before exhausting to atmosphere. The 3-bed RTO is similar to the 2-bed RTO. 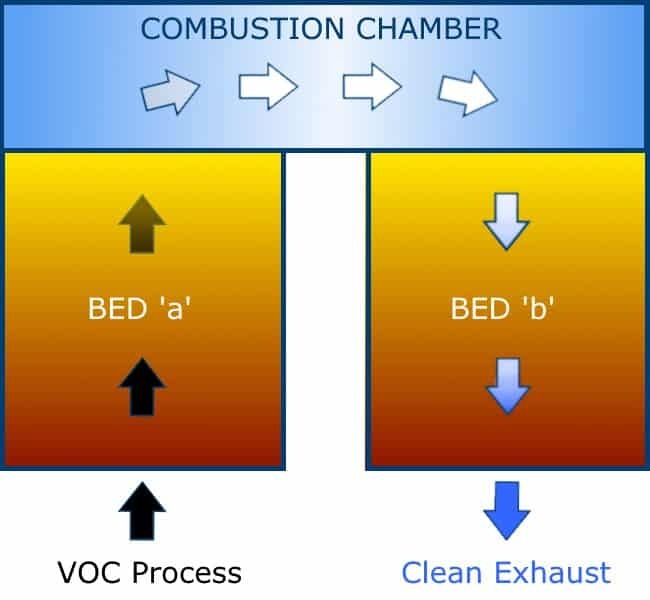 The VOC laden air stream enters the first heat exchange bed where the stream passes directly through the media where it is preheated in route to the combustion chamber where a burner adds any heat necessary to reach optimum combustion temperature and complete the oxidization process. The bed which was the last inlet bed will always be purged with clean air before becoming the outlet bed. The dirty air from the last inlet bed has to be cleaned out in order to achieve high destruction efficiency. Feel free to contact us directly or complete our detailed online quote request form. As air pollution control specialists, we have the experience that allows us to provide you with the best possible Regenerative Thermal Oxidizer (RTO) recommendation and we are available to answer any questions you may have about our RTOs and/or the Regenerative Thermal Oxidation process itself.